Construction of the Auglaize County Courthouse was completed over a century ago in 1894. Occupying a full city block in downtown Wapakoneta, OH, the building stands true to its original design. Ornate and dignified sandstone frames the two-story structure, which is capped by a clock tower and a recently renovated statue of Lady Justice. 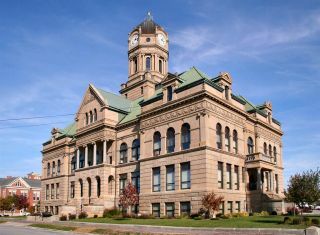 In order to bring its capabilities in line with 21st Century expectations while still retaining the charm and repose of its 19th Century origins, the county renovated the Auglaize County Courthouse to the tune of $30 million. Among the myriad renovations was an overhaul of the audio/visual systems installed in its three courtrooms. With limited space, a strict budget, and future-proof expectations, local integration firm RG Sound & Communications centered each courtroom’s new system on an Ashly Pema 8125.70 integrated processor and amplifier. “One of the first things that the county officials pointed out was how long the courthouse had been serving the community,” said Shawn Snider, project manager at RG Sound & Communications. “They expected these renovations to serve on a similar timescale. That meant that we needed to design and install an audio/video system that would be sufficiently flexible to meet their unanticipated needs many years into the future. With only slight variations, the installed AV system in each of the three courtrooms is more or less identical. Eight court-supplied microphones feed a court-supplied (and government-inspected and certified) recorder. It's mixed output feeds the first input on the Ashly Pema, and a redundant summed line feeds the unit’s second input. The remaining six inputs receive signal from an NTI audio/video matrix mixer, which is in turn fed by audio/video outputs at the lawyers’ tables and at other strategic locations throughout the courtroom. Computer control of the NTI matrix resides with the judge, who can patch any video input to any video output (including individual retractable flat screen monitors for each juror). Audio can be played in the courtroom if the judge so chooses. Because more than one video input can be selected at one time, the system accommodates multiple audio sources using the Ashly Pema’s inputs three through eight. The Ashly Pema’s eight amplifier channels power a distributed in-ceiling collection of Community DS8-series loudspeakers.